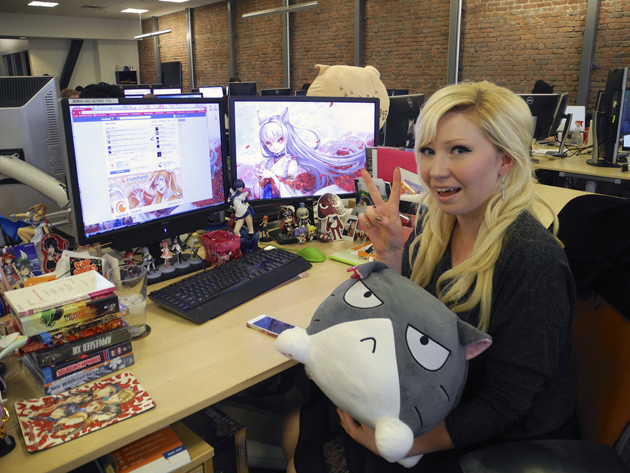 Holden at her desk in the Crunchyroll office in San Francisco. Victoria Holden gets paid to watch anime. But it’s not exactly as fun as it sounds. Holden is Crunchyroll’s marketing manager. Her job is to relate to fans over social media, which includes being well-versed any Crunchyroll shows they might be watching. During business hours, you’ll find Holden on her dual-monitor setup, anime streaming on one screen, Twitter open in the other. To most anime fans, it sounds like the 24-year-old has landed an impossible dream job. But Holden happened into it by chance. A cosplayer who goes by the name Sailor Bee, she was originally a regular host on Crunchyroll’s late webshow. When the show ended, Crunchyroll found a way to keep her on staff. “If it weren’t for my crazy knowledge of anime and manga and the fact that I’m part of their target demographic, it wouldn’t have happened,” she said. Indeed, few Americans know as much about anime and manga as Holden. Brought up by otaku parents, “they didn’t let me watch American cartoons growing up.” Armed with decades of viewing combined with watching the latest series each day at work, Holden can chat with fans of nearly any series. Check Crunchyroll on Facebook, Twitter or Tumblr, and you’ll get Holden chatting up a storm about anime. Last year, Holden attended more than 42 anime conventions, half of them for work. When you consider that there are just 52 weeks in a year, it starts to dawn on you just how tough Holden’s seemingly idyllic career really is. The highlight of her hard work? Coming up with Crunchyroll Ambassadors, a program that allows cosplayers and bloggers to evangelize Crunchyroll as compensated affiliates. It’s one more way to represent Crunchyroll through fans instead of “suits.” The program now has more than 86 participants from all over the world. The program was more successful than Holden could have imagined, and she still gets applications every day. But if you’re thinking of applying, her primary guideline is that you’re just as dedicated to Crunchyroll’s anime mission as she is. Wow what do I have to do to get that kind of job? Wow. That is amazing, but it must be tiering. Even I get tired of watching anime all day. It would have it’s perks though and it must be great to socialize with everyone. That is truly a hard job. I can barely watch the first episodes of all of them, much less the entire series. Wow, that sounds like a pretty awesome job, tiring, but awesome. I’m more into Manga myself, as my collection of 700+ manga would prove.Now if it’s a series I really like then I watch the anime as well, since I don’t have a lot of time to watch anime. I’d like to see her complete MAL. @Senjou, OMG that would probably be months or even YEARS of anime! Just be glad you have that job,there are millions of millions of people who would do anything just to have job like yours.If you get bored or tired of watching anime,leave you position,that’s not for you.I never got tired or bored watching anime and reading manga in my entire life.As an anime illustrator,that’s heaven for me. “I get bored watching a particular anime at my job” is a lot better than “I have a family and can’t get a job” , “the job I work at doesn’t pay well, I hate everything about it”, “my job is dangerous and I get hurt often and can’t afford the hospital bills”, “my job requires so much hard work and dedication that if I do not give my 100% into it, people can get hurt, sue me, or even die”, and/or “if I don’t do my job correctly, rapists, murderers, thieves, frauds, child molesters, drug dealers, etc. will be on the streets hurting people”. I think in the grand scheme of things, watching anime all day is not as tiring as you’d think. Huh. I used to watch everything of the new seasons for fun. Don’t have as much time for that anymore as I run 2 cons and have a day job, but I feel this is the type of day job I could do extremely well. Amazing job. It’s tiring and hardwork… but at least you do what you want… and it’s still an amazing job. LOL OMG!!!!! My dream job i already watch anime everyday! Who the heck hires 1 person just to watch every single anime series for fall season? It’s better if CR hires more than one instead of having one person to watch everything. But anyways I wish I have this job! She should write anime reviews as well for each episode. I think you are right, it may be too much for one person. But if your job is related to what you love doing, it’s not tiring even if you have a big workload. I’m a creative writer at Viewster.com (free movies, TV shows and anime online), and I really enjoy writing about these. Oh. My. God. Seriously?! SHE GETS PAID TO WATCH ANIME ALL DAY?! If only my job could be that amazing! I would take sitting in a chair all day watching Anime – even Anime I don’t like – to standing for 6+hrs per day at McDonalds serving people burgers all night. Ugh! What do I have to do to get a job like that? SELL MY SOUL?! Do you like anime? Where do you live? what do i have to do to get that money and what website did you get on! I know how it is to watch a lot of anime and to know a lot of seasons of anime after all I’m at the 270 watched and I’m still going with the new seasons of anime. and I don’t stop(help me). but you are doing a good job I think (I don’t use crunchyrool). but I understand how you feel and keep on doing what your doing. It may sound like a great job, but imagine this. She has to watch good anime, bad anime, gross anime, scary anime, funny anime, boring anime, trippy anime, and everything in between. That’s not saving lives, making small mistakes that could kill someone, handling bile, performing open heart surgery, rocket science, handling bombs, dodging bullets, etc. Watching an anime is watching an anime, just watch it. I do it all the time so I can review anime and if i got paid for it, you get I would just sit though it! It’s not painful, you’re not hurting yourself, you’re not putting others in danger. It’s watching anime and reading manga. Compare it to others and it really isn’t hat tough. It’s not like she’s doing back breaking labor, working her hands to the bone, heck, she’s not even compromising her self respect! Can you imagine stripping to make ends meet? The worst that could happen is she gets carpal tunnel or doesn’t like a particular anime. I fail to see the hardship. Dude u definitely haven’t watched Boku no Pico :p That was just a joke by the way. U want to know the hardships i will tell u some. Ur back hurts like hell after sitting in front of computer for hours and hours regularly. And not to mention the stress it puts on ur eyes. And u know irritation caused when ur forced to watch an really boring anime which doesnt interested in. Its as boring as watching others play an RPG. And the worst part is some people who dont like ur review of a certain anime treat u like crap like ur doing so just shut up. Every job has its Pros and Cons. Come on, it’s not a fun job, but it’s not really hard. There’s a lot of harder jobs out there, which involve danger, monotony, and bad pay. This is a good job, relatively speaking. I think her upbringing might be the real issue and not the job itself. I was brought up an otaku too but my parents although they are otaku as well, they let me watch what I wanted. She may have been overexposed to anime and manga so this job may be more tiring to her than to others. Every job on the planet has pros and cons but it’s all about finding what you are passionate about. I think she might just be sick of it because of her upbringing compared to others who weren’t born into it or had their own choice. Heck, there are people who find being a garbage man to be fun. That’s not something that can be stated as a fact “oh that’s not a fun job”. That’s an opinion that varies based on who you ask. Tons will hate it but a lot will love it as well. I would love to do this job where can i sign up? Looks like I have a mission. I’m gonna do it. I’m gonna watch every anime. I would love to have this job! I like anime and I’d rather watch anime all day but I don’t think that a job like this is perfect for me because I don’t really like going out and she has to attend cons, 1 or 2 won’t hurt but 42!? I like marathons so watching everything as they come out might not be such a good idea. I watch about 10-15 as they come out per season though, the rest can wait. Man, I wish CR could hire me too. This Job is the best can i do it when i graduate High School? It doesn’t seem that hard, With about 40 airing shows a season that’s hardly 3 hours worth of “work” a day, Which also the average time an Americans spends watching TV a day. This is a job I can seriously get behind! how do i get this job?? i want it!! I mean come on, who doesn’t want to sit in a seat for 5 days straight watching anime? I have seen almost every romance, harem, action, adventure, and mystery anime. Try me if you want, I gotta say though, my favorite kind of anime has to be anime’s like Blue Exorcist. and still seeing one piece, fairy tail etc. total how much i will be paid ????? This is Like she have so much fun. I think if i could do the same.